The new generation of Microsoft Surface has a 40 inch screen with full HD resolution of 1920 Ã— 1080. It senses both vertical and horizontal, powered by PixelSense technology with tactile recognition of objects. Microsoft and Samsung, in fact, have sparkled: the new SUR40 (that’s how you call the jewel), presented during the Keynote last Jan. 5 by Steven Sinofsky, is a phenomenon of technology and design, design for companies at the moment , without excluding the possibility that this gem could end one day, in private hands. The SUR40, in practice, is a large 40-inch HD LCD monitor, often about 4 inches (almost transparent) and completely touchscreen. The peculiarity of this device is to have pixel “special” which follows the PixelSense new technology: each pixel, just like a micro-cam, is perfectly capable of recognizing (through a mechanism of IR) is there anything leaning over, making it necessary – for example – a sophisticated scanner OCR. Even as regards the performance SUR40 has nothing to envy anyone, it mounts an AMD Athlon X2 Dual-Core 2.9GHz clock and an AMD Radeon HD as 6700m video card. Needless to say, the operating system is Windows 7 Professional 64-bit. This Article Has Been Shared 674 Times! First Anniversary Of The Customize Windows – Yes, One Year Ago We Started The Journey With This Domain Name. Read How To Be Successful From Our Experience. 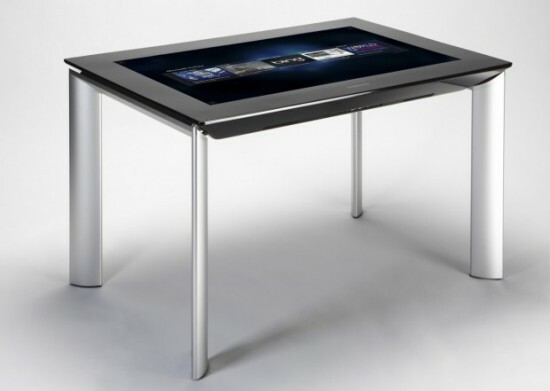 Cite this article as: Abhishek Ghosh, "Microsoft Surface 2.0 : watch the photos and videos of future computing device," in The Customize Windows, February 10, 2011, April 18, 2019, https://thecustomizewindows.com/2011/02/microsoft-surface-2-0-watch-the-photos-and-videos-of-future-computing-device/.